Here at Midland Handling Equipment, we provide companies up and down the UK with high-quality bottle conveyors for various applications from blow moulding to filling and packaging. We offer fully automated systems from low speeds to higher speeds depending on what product you are manufacturing so it doesn’t matter whether you are a soft drink company or a brewer we can provide you with the most efficient production line process. We design a bespoke system for you to suit the area you have. We have available different finishes to a configuration choice to match up with the specific usage demands. With pressure-less combiners and integral designing for drip trays, we can make you a bottle handling system that is streamlined and efficient. The loading and sorting of glass and plastic bottles, if you have multiple container types, they can be sorted into sections ready for filling and loading. 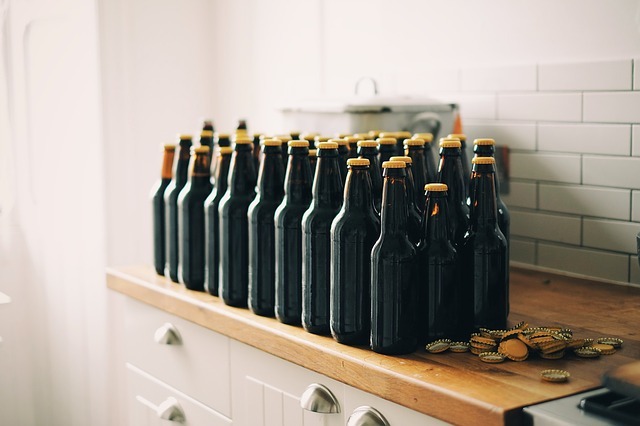 It is important when you are working in the food and drink industry to have clean and sterilised bottles and packaging to comply with health and safety regulations. With a bottle conveyor, this process becomes much simpler with the organisation of bottles. After the bottles are sterilised, you can start getting the product in with a filling mechanism, and this is normally where bottles go into a single file to make the filling process easier and quicker. The capping process shortly follows the filling with variations of different capping motions. Once the bottles are filled and capped they are ready to be moved to a different area in the factory or production line by turning and lifting them, these can be done one by one or in bulk depending on your needs. All of the above jobs can be done with a high-speed conveyor to make the process of loading as efficient as possible. Our systems also allow the rejection and diversion of bottles. If you have a bottle that hasn’t met the criteria of what is expected it needs to get to a rejection section through diversion and here at Midland Handling Equipment we think of the best possible way the conveyor can do this. During a liquid manufacturing process, there should be little need for human auctioning as they are self-moving and self-sorting providing smooth transitioning that consists of less manual action. Our stainless steel conveyors are ideal for washing down as and when it is necessary. Air conveyors, or inverted conveyors, allow your bottles to move above ground level before being filled, this type of conveyor allows more floor space to be available. These conveyors also have a faster response time closing gaps in production with simplified controls, and with less moving parts it means they are less expensive to manage. We provide a wide range of inverted chain bottle conveyors that ensure stability throughout all processes to make sure bottles stay in position. WHY CHOOSE OUR BOTTLE CONVEYORS? Bottle Conveyors are used in the Food & Drink Industry and other Industries that involve bottles and packaging. Our Bottle Conveyor Systems can be manufactured for irregularly shaped bottles, unstable bottles and include adjustable guardrails. What can Midland Handling offer you? Comprehensive Service – We provide a full range of services including design, manufacturing, testing, installation and administration. Our comprehensive services are all under one roof to make projects simpler and easier to keep within strict deadlines. Trained & Certified – All of our team members are Trained & Certified within their areas, and has experience working on a wide range of complex projects, both large and small. In-House Testing – The most important part when manufacturing complex conveyors is testing. We thoroughly test every product we make here at Midland Handling Equipment ensuring any faults are fixed immediately and tested again before installation. Documentation – Any documentation you need will be proved by our administration team this includes all Health & Safety documents. For more information on our Bottle Conveyor, get in touch with our friendly team today on 0116 259 3175. We also provide waste conveyors systems, gravity rollers, inverted power & free systems and powered rollers.